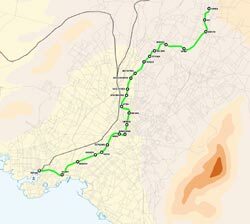 History of Line 1 – ΑΤΤΙΚΟ ΜΕΤΡΟ Α.Ε. In 1869 British entrepreneurs founded Athens – Piraeus Railways (SAP), a steam locomotive railway system, which connected the Port of Piraeus with Athens (Thissio). In 1875, the Company became a company of Greek interests setting at the time very ambitious goals for the extension of the network; however, these goals were only met after 1895, when the Line was extended from Thissio to the Center of Athens at Omonia Square. In 1904, the introduction of electrification constituted “a turning point” for this company. Athens – Piraeus Railways invested then significant funds and proceeded with the development of Faliro Bay as a recreational area. The railway system endowed the citizens of Athens with the opportunity to visit the area of Faliro by train and go to the theatre, visit a playground, the sea, A’ class restaurants, etc. There were no vehicles at that time in Athens and the railway was the only alternative for reaching Piraeus from Athens instead of covering this distance on foot or by using a carriage. In 1926, Athens – Piraeus Railways were renamed to Greek Electric Railways (EHS). At the end of 1930, the Line was extended from Omonia Square to Attiki Square. After World War II, in mid 1950, the Line was extended anew towards the northern part of Attica region (Kifissia). The Greek Electric Railways continued operating as a private company until 1976, to become then a property of the Greek State under the name of ISAP (Athens – Piraeus Electric Railways). Due to the fare collection policy, compatible with the cost of living, the EHS succeeded in becoming a profitable company without resorting to State’s aids or subsidies, and ensured continuous extensions of the network through reinvestment of the company’s profits deriving from its network’s operation. Under the 107 years of its operation as a private company, Line 1 played a significant role in the life of the citizens of Athens and Piraeus and was considered to be one of the most effective and innovating companies at that time. The properly defined personnel ranking, the salary hierarchy, the different regulations for “blue collar” workers and “white collar” employees, continuous training, etc., are some of the company’s main characteristics.